Reports of rope training provided for pupils at St Mary's School by visiting experts Pam and Tim Fogg, after they had run a course for the Tristan Conservation Committee. 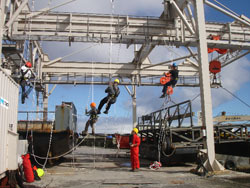 Pam and Tim Fogg from Rope Access Specialists Ltd Northern Ireland travelled to Tristan aboard SA Agulhas in 2009 to provide rope access training course for the Tristan Conservation Committee, as part of the South Atlantic Invasive Action Plan. The Plan is funded by EDF-9 of European Commission DG-Env, and managed by The Royal Society for the Protection of Birds. A full report and pictures from Pam and tim will be published in the February Newsletter, but we give a flavour of their work by showing two photographs below. Kirsty Green, Pam and Tim Fogg. Eugene Repetto, Conrad Glass (Chief Islander). Tim and Pam Fog came to Tristan on the SA Agulhas in September. They have been all over the world working for the BBC. Tim and Pam came to Tristan to show the young adults about rope work. 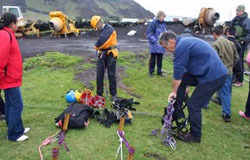 On Thursday morning 24 September Miss Sharon said that Tim and Pam were going to show class 4 and class 3 about Abseiling. We were nervous about it. We were taken down by the edge of the cliff by the East side of the harbour at 10.30am. It was a wet day and a bit windy and the sea was rough at the harbour and there were waves crashing noisily against the volcano. I felt scared and shaky at first. Looking over the cliff we could see lots of JCB on the beach and the cement mixer was very noisy. Class 3 and Class 4 went down onto the East side of the bank by Puma road with Tim and Pam. Tim and Pam gave a short talk about the safety rope that they use for rope climbing and showed us what each colour stood for, pink was for safety and white is for abseiling. He showed us the harness that would be fasten between our legs and around our waists, the helmets were brightly coloured red orange blue and yellow. Pam demonstrated to all of us how the equipment would be used. Pam then went down from the edge of the bank above where the cement mixer was on the beach and we all watched how Pam climbed down the rope while Tim held onto the other rope from on top of the bank. After Pam finish demonstrating Riaan was the first one to climb down the rope. It eventually was my turn I felt a bit nervous as I was coming down it was fun. On top of the cliff there was lot of grass and it was a bit wet and gravel came down. Further down the rock was hard and my feet could grip better. When all of us had a turn we went back to the school and we hoped that Tim and Pam would come to Tristan again. 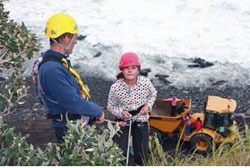 On the 10 th of September 2009 the S.A. Agulhas arrived with two expert rock climbers, their names were Tim and Pam Fogg. They were here to train some people to rock climb and abseil. On Thursday the 24 th of September Tim and Pam came to talk to class 3 and class 4 about abseiling and how to use the ropes. Then we went down by the bank on the east side of the harbour by the cement mixers. When we got there I felt nervous. The sea was rough breaking over the point of the harbour, and it was quite breezy. When we were on top of the cliff Tim showed us how to put the harness on, and also told us how far the poles were down in the ground because the abseiling ropes were tied to them. Tim told us that the ropes can hold three tons. The pink rope was the safety rope and the white rope was the one you descend yourself with. 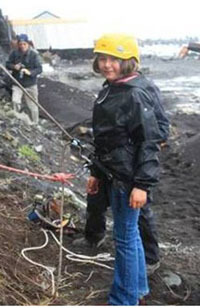 Then Pam put on her harness which contains a carabineer, reverso and a safety helmet. After that Riaan and Dean put there harnesses on. Next we went down the beach and watched Pam abseil down, when I saw Pam go down I wasn’t that nervous. After that Riaan and I went up to the top of the cliff. Riaan abseiled first then it was my turn, when I got half way I was feeling confident. Later I went first down the second cliff that was higher, steeper and more difficult. When Linda and Kimberly went down they slipped a little bit. There were lots of mixers, JCB’s, dumper trucks and tractors down there too. Miss Anne, Mr Jim and Anja went down the second cliff, and in fact they were very good. After that we returned to school. Everyone hoped that Tim and Pam could come back to show us more skills about abseiling, because they were very nice people. Tim and Pam Fogg were experts on rock climbing. They were here to teach Tristan people to abseil down some edges to get alien plants that don`t belong on Tristan. 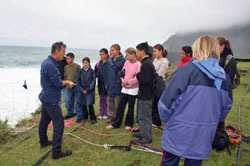 They came up to St. Mary’s School to take class 3 and 4 to do some abseiling down cliffs. We abseiled down the cliff by the east side of the harbour. The day we went abseiling was on Thursday 24 September. It was a kind of wet and damp day the sea was very rough and it was breezy. There was JCB's, dumpers and tractors making a lot of noise. 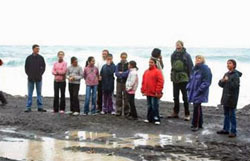 I felt very nervous and I got a little scared looking at my class below on the beach. When we were at the top of the bank Tim told us about abseiling and how to put the equipment on. We all had to wear a harness and helmet. Pam was the first one to go down to show us how it was done, so all of the class went down to the bottom of the beach to see her demonstration. When I was looking at Pam coming down I felt excited and could not wait until it was my turn. Riaan was the first boy to go, Dean was the next boy to go then Julian was the last boy to go. Lynette went after Julian and when she was finish some more girls went for their turn one by one until it was my turn to go. I went to the top of the bank where I had to abseil down. Tim put the life saving rope on after that he put the next rope on. Tim fastened it with a carabineer, when he finished putting that on he told me to lean back as I abseiled down the rope. Suddenly when I looked over the side I felt very scared and nervous. When I started to go down there was a grassy part that was a bit crumbly then it was solid rock and I felt more confident. When I reached the bottom Pam unfastened the rope and I shouted “rope free”. After I had my turn some more girls went after me, even Miss Anne and Mr Jim went too. When all of us were finished coming down the last cliff. We thanked Tim and Pam for the thrilling day. Then we went up the school again. 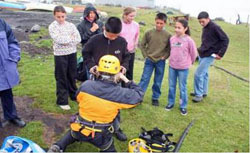 On Tuesday 24 th September Tim and Pam Fogg came to St.Mary's School to take class 3 and 4 abseiling. 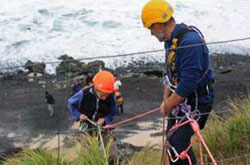 Tim and Pam were here to teach people rope work so that they could get rid of invasive species of plants on sea cliffs. We went abseiling on the side of a steep cliff near the harbour. Before we went down they showed us how to put the abseiling gear on. We went down abseiling at 11.00am; the weather was foggy and the waves were crashing against the shore. We were down by the harbour bank up on a steep cliff. Tim and Pam showed us how to put the equipment on. First Riaan and Dean went. When I went to look over, it looked very scary. Then Pam went down and showed us how easy it was. Then it was my turn. When I went down on the side of the cliff I felt terrified as I got halfway down Tim encouraged me to carry on. Then suddenly I slipped! After a while it was my turn on the second,[more difficult cliff] I felt very positive when I got finished I was very delighted and proud. Soon we had to go back up to St. Marys School before it rained. The equipment I was wearing included a helmet, carabineer, harness, safety rope, and a reverso, then Pam would shout to Tim [Rope free]. On the second cliff most of the class did not have a go. Mr. Jim went down on the first and second cliffs. Later on Miss Anne came down and had a go. Then we said Thank you to Tim and Pam, and I think everyone enjoyed their day. On Thursday 24th September we were asked by two amazing people, Tim and Pam Fogg if we would like to go abseiling. All of my class agreed and said yes. Tim and Pam are very nice people who have had many experiences on this kind of job, they came to Tristan to train up some of the young people to rock climb and abseil. 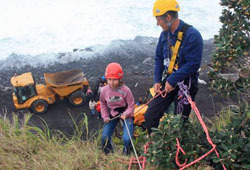 They needed to know how to do this sort of job properly to help take care of any invasive species of plants on the sea cliffs of Tristan, Gough, Nightingale, and Inaccessible. 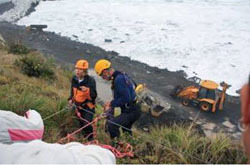 Tim and Pam have also worked on many cliffs on many islands around the world. So at 10.30 am Tim, Pam, my class and I all went down to the site where we were going to abseil. On the way down to the site, which was on the bank at the east side of the harbour, I could see huge waves splashing over the point of the harbour and volcano. It was quite a nice day, a bit cloudy and a little breezy. I was starting to feel very anxious and nauseous almost like I was going to throw up, but when Tim and Pam explain it all to us, I started to feel a little excited. At the time when we were doing our abseiling there was also things going on down at the harbour, like the JCBs tractors dumpers and the mixer was going. tussock grass that was in the way. When my turn finally came Anja and Pam put all the things on me, first it was the harness, and then the helmet. At the time when I was descending I felt a bit anxious, then I start to feel elated but I still felt a bit shaky, because when I had to lean back on the rope I was afraid and I was thinking the rope might break. When I looked up at Tim he had the ropes well secured so then I knew that I was going to be alright and safe. When I eventually reached the bottom I felt very glad because I had actually made it and I was pleased with myself. While we were waiting for our turn some children were eating their break and playing in the old dumper trucks on the beach and some were playing games with their hands. 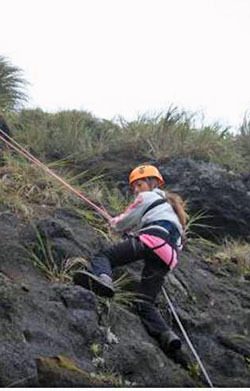 The time came when we were all finished, so Mr. Jim and Miss Anne took their turn abseiling. After everyone was finished we all went up to the school feeling happy and proud. 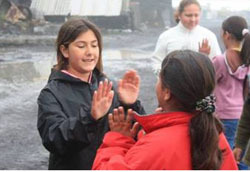 On Thursday 24th September my class and I were introduce by to two delightful people. 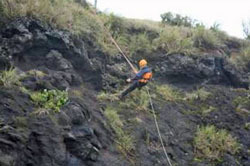 Tim and Pam Fogg were asked to come to Tristan to teach some of the young islanders to rock climb and abseil to help them take care of the invasive species of plants growing on Gough and around the island. Tim and Pam are well experience on this sort of job; they worked for the BBC in other parts of world. It was a windy, misty, day when Tim and Pam came to collect us from the school at 10.30am, at first I felt a little nervous, but at the same time excited. Our position for abseiling was down by the bank on the East side of the harbour .As well as our abseiling going on there were also other things around us, like JCB's dumpers, tractors and the cement mixer. The sea was rough; the waves were crashing over the harbour and volcano. My class and I went to the top of the cliff and Tim showed us what we had to do. Pam and Tim showed us the equipment, and then Pam did a demonstration. We asked Miss Sharon would she like to go, but she said a million times she wouldn’t go, because she was frightened. If she had to go we would see finger mark on the rocks! 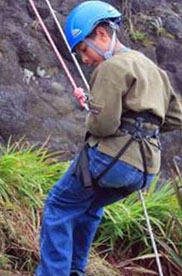 Dean was the first to try abseiling down the cliff. Julian went after Dean and he went like a shot out of a gun! Lynette was the first girl in our class, and then Rachel, Kimberley and Linda went after Lynette. After Kimberley came down I went up on the top of the bank. I had a helmet on, a harness, abseil rope, safety rope, carabineer and reverso that the abseil rope goes through. 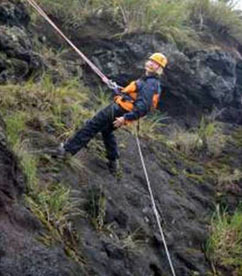 Tim put the safety rope though the carabineer so if we fell Tim would catch us. When I was going down the rope I felt alarmed, unhealthy and cold. When I was going down the cliff it was crumbly at the top but when I got to the solid rock it was easier and I felt excited and elated. When I got to the bottom of the cliff I had to shout “Rope Free”. After I was finished we had some food and so did Anja. While the rest of the children were having their turn Riaan, Dean, Kelly and I played in the dumper on the beach. By this time Mr Jim and Miss Anne were having their turn to abseil. By the time everyone was finished it was 1:50pm so we all went back up to the school, and at this time I felt great and happy. At the end of the day we all told Pam and Tim thanks and hoped that they would come back again. We went back to the school, as I was walking up I felt grateful of what Pam and Tim did for us. Tim and Pam Fogg go all over the world working for the BBC. They do rock climbing and use ropes to get people into very high places. On Thursday 24th September Pam and Tim took us down by the bank on the cliffs at the east side of the harbour to do abseiling. It was bit cold and windy and the sea was rough. Waves were breaking over the harbour and it was very noisy. The class was a bit frightened and scared and also excited. When we got down there Tim told us about the ropes and the equipment. 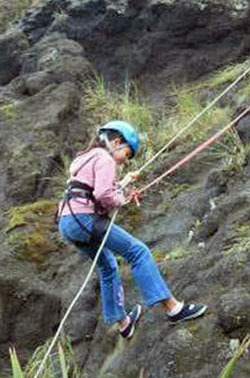 Before we went abseiling pam demonstrated how to go down the side of the cliff. When Pam abseiled we all ran down the beach to see Pam coming down. Soon it was our turn to go. The first two to go down were Dean and Riaan. Then after that it was Lynette and Kimberley’s turn. After kimberley it was my turn so I put my helmet on. Pam put my harnerson on. I went running up on to the bank. When I got there Tim put the reverso on and my safety rope. When I got over the wire to go down at the top it was a bit muddy so when I got down on the solid rock I felt much better and when I was finished everyone cheered at me. When Pam got me unclipped she shouted, “rope free”. Then four of the girls went on a second and more difficult abseil. Miss Anne also went first on this one. When the day ended we all said thank you to Pam and Tim and told them that we all enjoyed this new experience. On Thursday 24th September Tim and Pam Fogg came to the school to talk to us about rope climbing and abseiling down cliffs. Tim and Pam are very good at rope climbing. They also have been on the BBC. You may not have noticed them but they climb trees and pull the big cameras up so that they can look at different animals. They were here to show the young people of Tristan how to rope climb so that if they needed to go down the side of a cliff to cut trees down they would not fall. That is what we did but we didn't cut down any trees. We went to the cliffs on the east side of the harbour. We were all very excited. It was a bit windy and wet, the sea was roaring and it was very rough, the waves were also hitting up against the volcano. While we were at the top of the cliff Tim and Pam showed us the ropes. One rope was pink and one was white. He told us what each of the ropes were for. When he was finished talking he told us that Pam would show us how to do it. So Pam descended the side of the cliff and waited until we got on to the beach. We looked at her going down the cliff; she was really good at it. After she was finish she told us to keep our legs wide apart so we can’t slip sideways and if we put our legs together we would slip sideways. Then she asked us who would like to go next and the two boys called Riaan and Dean volunteered to do it. Pam got their equipment and asked them what colour helmet they would like. They chose their colours and went to the top of the cliff then Tim fastened them to the ropes with a carabineer and a reverso. Riaan went first he was very quick and he remembered to keep his legs apart. When he got to the bottom he shouted “ROPE FREE” so that Tim knew when to pull the pink rope up. While Dean was coming down the side of the cliff Riaan gave his equipment to Julian and he went up to the top of the cliff. When Dean was finished Tim pulled up the rope and then clipped it to Julian. While Julian was on the side of the cliff Dean gave me his equipment. I was the first girl to have a turn. Julian was now finished and it was my turn. When Tim clipped me to the rope he told me to get over the wire. While I was getting over the wire I felt very scared like I was going to fall. As I was going onto the side it was a bit muddy but I managed to get past it. When I was haft way on the cliff I felt so happy. When I got to the end I felt very pleased with myself. The other girls had a turn. After all of us were finished Mr. Jim and Anya had a try. We all tried to get Miss Sharon to have a turn but she just said “NO”! Some of us had a turn on the harder cliff and Miss Anne, Mr. Jim and Anya also had a turn. It was a bit muddy but it was terrific it was also very steep. We were all frightened but it was good. When we were all finished we told Tim and Pam thank you and we all enjoyed it and hoped that we could do it again one day. Everyone was pleased that we had all managed to abseil down the cliff. We came up to school and went home. 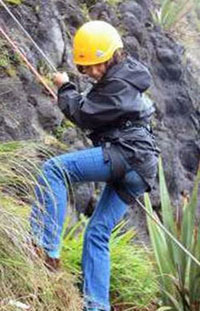 It was Thursday 24 September and it was Abseiling day. Everyone in my class had different feelings but I was very anxious about going. Then Tim and Pam Fogg came through the door and I started feeling excited about doing it. Pam showed us how to put the gear on but she demonstrated it on Caryn and then they said we are going down to the beach. Before we were about to go everyone waited patiently up on the cliff. Tim told us how to go down the cliff then Pam demonstrated how to descend the cliff. Pam waited until we all got down to the beach when she saw that we were ready she started to abseil. She told us to keep our feet apart and to lay back and let the rope loose. The first volunteers were two boys Riaan and Dean, Riaan went first to abseil down the cliff then Dean went. Lynette went and then another girl and then another but when Linda went she slipped and I started to feel very scared. Eventually it was my turn and as I was going down the children were laughing at my socks and they was laughing at Rachel’s pants! 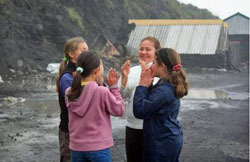 On the second cliff, which was more difficult, children waiting at the bottom played in a dumper truck. Three of our teachers went, Miss Anne, Mr. Jim and also our garden teacher Anja went abseiling. Rachel, Caryn and I didn’t want a second try because we were very scared we might fall but our best friend Kimberley did. Before Caryn Rachel and I left the beach we told Tim and Pam thank you and we had a very nice and joyful day. On Thursday the 24th of September around about 10:30, my class and I were sitting in our classroom. Miss Sharon, our teacher, said that Tim and Pam Fogg were coming over to teach us abseiling we all felt nervous but in a way excited. First Pam showed us what to put on. 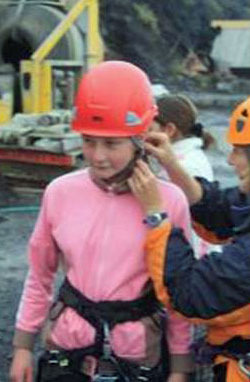 She tried the harness and helmet on one of the students, Caryn. Then Tim said that the ropes would be safe. Tim and Pam had been all over the world with the BBC. They had been helping people make films by taking cameras up in trees, and caves to film. 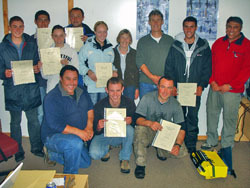 They came here to teach young adults to rock climb so that they could take invasive species of alien plants out of the sea cliffs of Gough, Inaccessible and Nightingale. Finally we were down to the bank the east side of the harbour. Pam showed us what to do to abseil down the bank. Eventually it was my turn. As I was going down I felt all sort of feelings like anxious and pleased. The weather was not very nice and the sea was rough, crashing over the harbour. Down where we were was a mixer and tractor, dumpers and JCBs making a lot of noise that was distracting. While we were at the top of the cliff, Tim told us what to do and said that everything was safe so nobody should get frightened or hurt. He then showed us two ropes. One was pink which Tim tied himself to. He said that if you slipped then the pink one would stop you from falling, and the white one you will abseil down. Pam did a demonstration of what we were supposed to do. She instructed us to put our feet apart and lean back but not too much. Just Riaan and Dean volunteered to go first. When everybody saw them they felt more confident. Then it was Julian, Lynette, me, Kimmy, Janine, Linda, Caryn, Leanne, Kelly and the last one was Natalie also Jim our teacher and Anja our gardener went. As I was going down the rock on the top was crumbly and that is when I was worried! But as I was going down further the rock was more solid, eventually I was at the bottom and was very relieved when I had to say, “rope free”. Some of the girls and boys were playing in one of the dumpers while the others were abseiling. It was a lovely day and we were very happy because we spent it with Tim and Pam and learned something new. One day two Expert rope climbers, Tim and Pam Fogg, came to talk to us. They were here to train a group of young islanders all about rope work. On Thursday 24 th September they came and took Class 3 and 4 down by the cliffs on the East side of the harbour to go abseiling. On that day it was dull and the sea was rough. I felt excited as l looked over the cliff and saw mixers going and JCBs down below on the beach. how to put the equipment on and named all the things that were on the harness that we were supposed to use. After that Pam demonstrated how to abseil down the cliff and also told us to keep our feet wide apart on the crumbly rock so that we wouldn’t slip sideways. When she was going down all of us ran to the bottom of the cliff and looked at her. At that moment I felt excited. Eventually it was time for us to go and I went first. So I went to the top of the cliff and put the harness on. Then Tim told me to clip the rope on and climb over the fence. As soon as I looked over the side of the cliff I started to feel shaky and trembly. When I started over the side of the cliff it was muddy as I got further down it started to get soft. Then near the bottom the rock started to get harder. After that it was the other children’s turn. When I got to the bottom I felt happy with myself. When everyone had their turn Tim asked if we would like to try a more difficult cliff and some of us said yes. So we went but this part was a bit harder. Some teachers went their names were Miss Anne, Mr. Jim and Anja our garden teacher. After everyone had a turn on the harder one we all went and said thank you to Tin and Pam and then return to the school.